Ingrid Bolton, Layered landscape I, 2017. Various metal cables, metal box, 15x15xvariable cm. Courtesy of the artist & Berman Contemporary. Although Burke’s definition of a social contract was born out of his belief that a good government is a gift from God, today, this partnership – or social contract – seems to be diminishing. In an age in which social media giants, such as Facebook and Twitter, are beginning to be questioned about their expanding role and responsibility in the distribution of information, and ‘connectivity’ has reached an entirely new meaning due to the rise of digital and social media, it has become more pertinent than ever that we re-evaluate contemporary society’s social contract, and the partnership or connection between present generations and the generations to come. Considering Burke’s notion of a good government being a gift from God, one is pressed to question just where this God may be when we look at the governments in power today – Donald Trump’s Republican and climate-change-denial rule over America, Syria’s Bashar al-Assad and, closer to home, President Jacob Zuma and his formerly glorious African National Congress (ANC), to name a few. They have hardly considered the generations to come when acting as leader, and it is no wonder that a social contract – true global connectivity – has diminished. For Ingrid Bolton, a South African artist with a past in microbiology, as human beings, we are microcosms within the macrocosm community and we become more than just ourselves when we form connections. Her work, a series of numerous copper threads that have been combined to look almost like organisms under the microscope, is a critique of our ever-diminishing social contract, regardless of increased global, digital connectivity. Bolton works with recycled copper as a means of proving just how important true connectivity is – due to its conductive ability, copper enables the generation, distribution and use of electricity in homes and industries, as well as the delivery of clean and safe drinking water, so without copper, society as we know it would come to a halt. Africa produces about 900 000 tons of copper per year, accounting for about nine per cent of the total copper that is mined in the world. 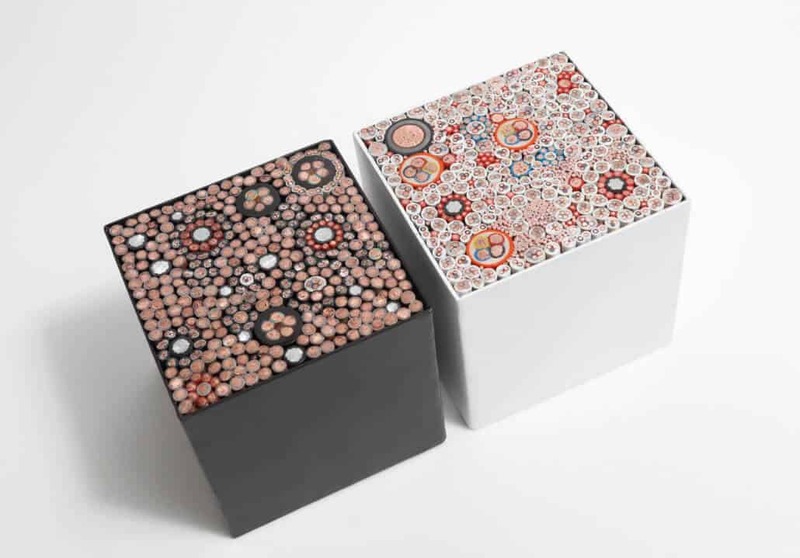 INGRID BOLTON, COPPER CUBED I (LEFT), 2017. METAL BOX, VARIOUS CABLES. FLOW (RIGHT), 2017. METAL BOX, VARIOUS CABLES. 15X15X15CM. COURTESY OF THE ARTIST & BERMAN CONTEMPORARY. 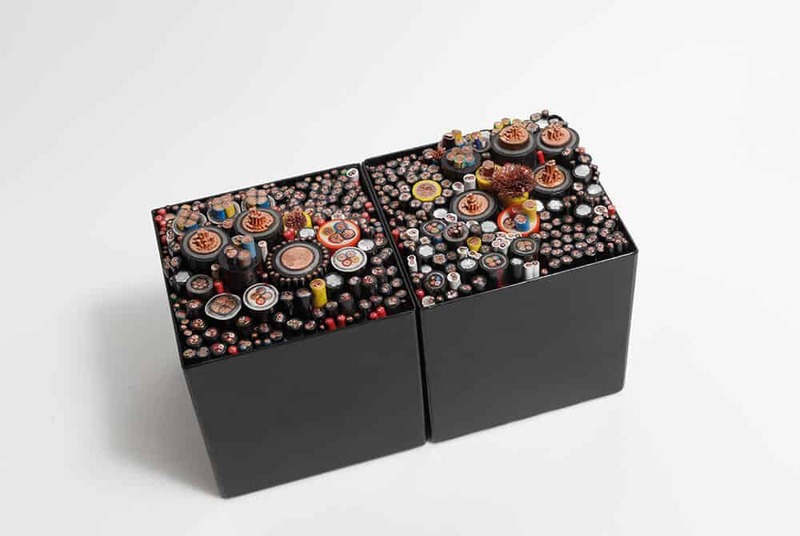 In her 2014 series, ‘Connect/Disconnect’, Bolton deconstructed copper cables into individual strands, and subsequently reconstructed them into cubic shapes – a visual exploration of how and why connectivity, or partnerships, is essential to both the security and growth of humanity. And it is exactly this that Bolton continues to address in her latest series, ‘Reconnect’. She embraces the notion of true connectivity, both on microscopic and macroscopic levels, and re-establishes the importance of Burke’s social contract, while tackling the copper depletion issue head on. Bolton continues to explore copper as a medium to comment on how our use of the metal today will affect the generations to come. INGRID BOLTON, LAYERED LANDSCAPE, 2017. METAL BOX, VARIOUS CABLES, 15X15X VARIABLE. COURTESY OF THE ARTIST & BERMAN CONTEMPORARY. Bolton has also included a tactile element in her work, varying the textures of the copper substantially – some pieces are frayed with fanned edges and are quite uncomfortable to touch. At once rendering connection physical and involving her viewers in the work, she attempts to make us see the importance of connectivity and how these connections, or perhaps lack thereof, act as causes that will return to us as effects. For Bolton, these causes are primarily the way in which a global demand for copper has had both micro and macro implications for South Africans – and with the ever-decreasing finite supply of copper, the global community alike. These causes also speak directly to Burke’s social contract where contemporary society – both world leaders and citizens – have failed to acknowledge the importance of a partnership between current generations and those still to come. In light of this, Bolton’s work is at once a celebration of the connection between generations, the connection between science, nature and art, and a lesson on the effects of connectivity. Ingrid Bolton’s ‘Reconnect’ will be on exhibition with Candice Berman Contemporary at Investec Cape Town Art Fair 2018. Ellen Agnew is a writer on ART AFRICA’s editorial team. FEATURED IMAGE: INGRID BOLTON, POWER CUBED, 2017. 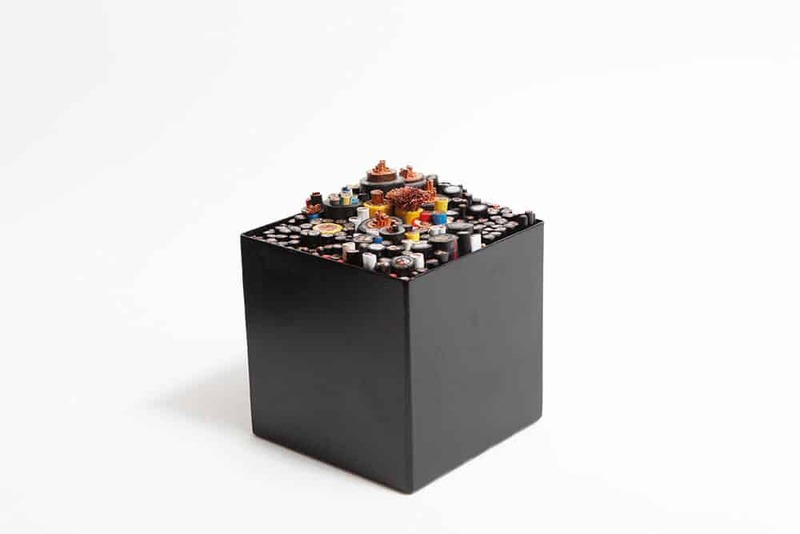 METAL BOX, VARIOUS CABLES, 15X15X15CM. COURTESY OF THE ARTIST & BERMAN CONTEMPORARY.